When tiles begin to curl, they most often need to be replaced. 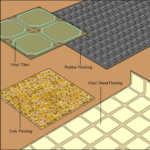 First find out if your flooring or its adhesive contains asbestos, known to cause cancer if inhaled. Consult an expert to determine if this is the case. Asbestos-control experts often recommend encapsulation rather than removal. When the seams of vinyl sheet flooring separate and pucker, you can glue them back down with a vinyl flooring sealer kit. 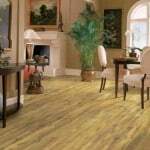 Generic types are available at home improvement stores; better, order kits made specifically for your type of flooring (if you know the brand) from a flooring dealer. Discoloration that results from wax buildup is easily remedied. 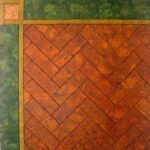 Use a solution of white vinegar and water or a cleaner specifically formulated for your type of flooring. Mop the solution onto the surface with a sponge mop and then rinse with clear water.